In 2010, the Falmouth Public Library held a wealth of unprotected and uncatalogued archival materials that were not easily accessible to the public and were at serious risk of deterioration. 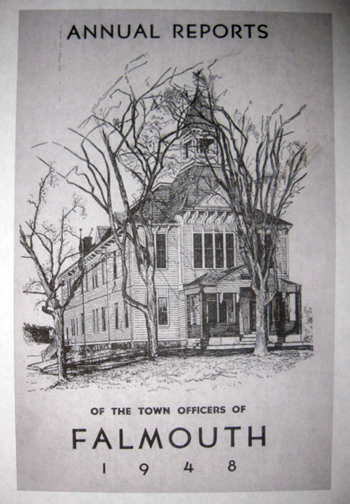 These materials included Town Reports dating to 1884, an index for the mail-away edition of the Falmouth Enterprise, and an annual Falmouth Enterprise supplement containing articles about Falmouth and Cape Cod history dating from 1932 to 1985. There were also microfilms of the Falmouth Enterprise back to 1892, microfilms of ships’ logs – one from 1806. The collection included the Falmouth Survey of Old Houses Historic Register, books on local history, directories from 1900 and 1903 and several historic maps. These documents served as important resources for students, educators, historians, and genealogists but if not preserved were at risk of loss. The 2006 Falmouth Library Foundation paid for an initial study of preserving the archive. In 2010 the Falmouth Public Library Foundation applied for and received a CPFund grant of $4,950. With an additional grant of $850 from the Foundation to meet the $5,800 cost of the project, the Library began a process to identify and evaluate the materials, to repair them as needed, to place them in an acid-free environment monitored and controlled for temperature and humidity to prevent further deterioration, and to develop a comprehensive plan of action for digitizing and cataloguing the documents to make them searchable online by the public. This phase was completed in 2011 and the Falmouth Public Library Foundation applied in that year to the CPFund for a second grant to implement the digitization plan. In 2011 the Falmouth Public Library applied for and received a second grant from the CPFund, for $203,894, for Phase II of the digitization of its archival records. Once the CPFund grant was approved, the Library received a $7,500 matching grant from the Horizon Foundation to reach the project’s total cost of $211,394. This project implemented the recommendations made in the plan funded in part by a 2010 CPFund grant. Because of the 2010 report, the Library had a complete understanding of what its historical archive contained: Falmouth Annual Reports from 1865, 1872, and 1875 through 1862; Bourne, Falmouth and Sandwich directories from 1900 and 1903; 1880, 1910 and 1907 atlases of Barnstable County; the Falmouth Enterprise from 1896-1962; ships logs; miscellaneous Town records from 1668 to 1960; and miscellaneous library records from 1794 to the 1960s and beyond. Now that the Library’s historic resources had been identified, repaired and preserved properly in acid-free boxes in a climate-controlled environment, the Library began the process of digitizing all of the materials, indexing them, and publishing them in searchable form on its website. This work was completed and the archive went online in 2015.